This one is actually my favorite of them all as it was my first birthday cake for a kid and my niece Chloe had this opportunity to be the first. It was with this photo that my first orders came on Facebook. 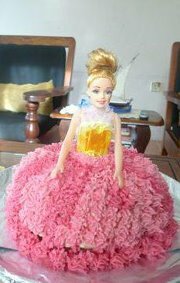 The base was a vanilla cake and the torso of the Barbie inserted in middle of the cake. I decorated the base with vanilla butter icing and finished with pink butter icing making the dress look fluffy.